120 pages | 55 B/W Illus. While it is a given that most Lean companies adopt methods to standardize cyclical activities, they often fail to apply the same rigor to noncyclical work, believing that it cannot be measured. 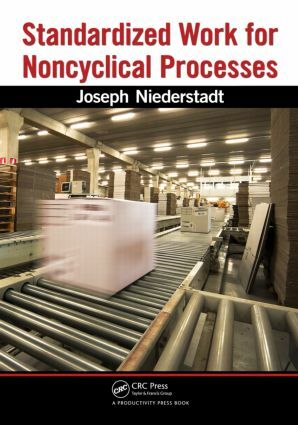 Standardized Work for Noncyclical Processes cuts to the core of this mistaken belief and shows you how to measure nonrepeating job processes and eliminate waste associated with noncyclical activities. Taking a hands-on approach reflective of his time as an operator on the line, Joseph Niederstadt lays out the methods he has instituted successfully in more than 30 factories around the world. He defines and details a proven process for building consistent quality products at reduced costs, and includes coverage of activities involving multiple machine job setters, maintenance, stockers, and quality auditors. When implemented correctly this method can help you increase utilization to 85 percent through intelligent data collection. Throughout the text, the author references blank forms and offers numerous examples of what the forms should look like when populated with the proper data. The CD that accompanies the book includes e-versions of all the forms, as well as color versions of images found in the text. "Where there is no standard, there is no improvement." The accompanying CD includes electronic copies of the forms discussed in the text as well as color versions of images in the book. Joseph Niederstadt was born in Saginaw, Michigan, in the early 1950s. This was a town that depended heavily on the automotive industry, as did many midwest towns during this time period. Industry was booming and mass production was well on the way. The automotive industry employed tens of thousands in the area, providing a standard of living for those working in the factories that few had ever seen or probably will ever see again. Later at the Chevrolet Motor Division, Niederstadt was an assembly line operator, a material handler for the assembly line, repair man for assemblies, and a part-time fill-in for the assembly job setter. After several years in these positions, he applied for and was accepted for a supervisor’s role. Whether it was at GM or Delphi Automotive Systems, his supervisory experiences included broaching, machining, assembly, after-market operations, quality control, maintenance, receiving, shipping, production control and logistics (including coordination of the entire facilities annual inventory activities), stampings, blanking, rubber extrusion, and plastic injection molding. Later, as advancements came his way, he also gained experience in labor relations, implementing, coaching and mentoring others through the Divisional Lean Core Team, supplier development, and international assignments. He also won one of the very first mentoring awards given by the Delphi Corporation (Troy, Michigan). During this progression, Niederstadt has never forgotten his roots as an operator and has always strived to make the work environment better for the operator. He has lived through the transition from mass to lean production, from the “do as I tell you” mentality to a team-managed work system, from massive inventories to “Just In Time” philosophies, from “run all you can every time you can” thinking to PULL systems, from dedicated equipment to flexible cells, from changeovers that took days to ones that now take only minutes … the list goes on and on. He has been taught by several senseis from Toyota as well as some of the best Lean people at GM and Delphi. Niederstadt has worked in the United States, Canada, Mexico, Brazil, Taiwan, India, Korea, China, and Thailand, applying the system approach that is included in this book. Most recently, he was the director of Lean Applications Asia–Pacific Region for a global corporation and responsible for leading the implementation of Lean in 26 facilities in 11 different countries. He is currently an independent consultant applying Lean tools to manufacturing and SGA (salary general and administrative) operations.